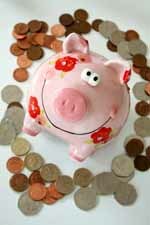 Baby Budget - Learn Just How Much a Baby Costs and Tips to Cut Costs. As a mom of four, I can tell you there are several aspects to a baby's budget and realistically, that budget expands to what you have and are willing to spend. We'll look at the minimum costs that you will have to budget for your baby in the first year. The average cost of a child in its first year is roughly $6,000. And, to be honest with you, most new parents don't allow for that figure in their budget. Costs associated with a new baby are easy to underestimate since we tend to think such a 'tiny thing' won't cost that much. $1000 on other nursery furniture and decorations - changing table, chair, side table, bedding, etc. Well, the good news if you have more kids, your first year's baby budget won't need to be as high since you can re-use some of this stuff. There are also hidden costs to having a baby and to some extent these vary from family to family and it does depend on whether this is your first child or not. These costs may include some of the following, and in some cases additional help will be provided by grandparents, but the costs should be factored in as there is no guarantee that grandparents will always be there. Loss of earnings as a result of time off either through ill health of the child or unpaid maternity leave. Before getting pregnant, it's a good idea to research the impact that a baby will have on your family finances. If most people did this they may not have a child, but by being forewarned at least you won't be surprised by the impact to your finances. If nothing else this exercise will help you work out how much of your monthly finances will go towards raising your new baby. And, just because you have a baby budget of the cost for the first year of life doesn't mean that it has to cost that much. The purpose of your budget is to get you to reflect on where you would like to make cuts. Substantial savings can be made, for instance you can look for hand-me-downs from friends and relatives. See my page on cheap home furniture for some great ways to save money on baby furniture. The purpose of this baby budget is to give you a realistic view of what a new baby is going to cost you and to help you decide what you have to have for your peace of mind for your new baby. In other words, what are your baby's basic needs going to be? What 'baby stuff' can you not live without? And, ultimately, if you want to save as much money as you can with a baby budget, you're going to have to get back to basics with no frills when it comes to outfitting your baby's first year. This is really hard when there are so many cute things out there for a baby. But, don't fret, more than likely, you'll receive a lot of cute things as gifts for you and your baby. Bottom line, to save money, learn to eliminate things you can do without. Use this baby budget building exercise as a tool to help you weed out any unnecessary baby items. This baby budget is based on your individual circumstances and needs and once this baby budget is in place for the first year of your child's life, then this formula can be used again and again as your child grows and their needs change. Photo courtesy of Steve Woods may not be copied, reproduced, or sold.